After yesterday's tough hike (on top of a truncated morning speed session) I really wanted to give myself a day to recover. The weather for Saturday is not promising. It's supposed to rain the first half of the day and I wanted to get in one more long run before I tapered for my upcoming race. 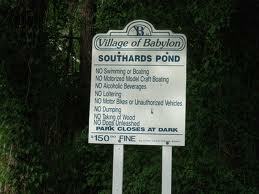 I decided to run the trails along Southards Pond and Belmont Lake in Babylon. These trails make up the Dirty Sock 10K course, one of my favorite places to run and a perfect spot for a training run. I started at the trail head that serves as the exit to the Dirty Sock finish line and as I ran I thought about how two of my four hardest races were run on this course. Part of that related to the late August dates of the Dirty Sock race and the heat and humidity that comes with that. Today it was cool (42° F) and dry, so I had little concern that the weather would affect my performance. I reached Southards Pond quickly and soon connected to the main trail that took me under the RT 27 trestle where a flutist was playing the Hollies' song "Bus Stop" (Bus stop, wet day, she's there, I say / Please share my umbrella). It's not the first time I've run through there accompanied by flute music but it was still an unexpected pleasure. The path winds quite a bit from there and eventually goes under the Southern State Parkway that sits just south of Belmont Lake. I ran around the lake taking in the water view, trees, ducks, swans and geese. I was feeling good so I ran a second time around the lake before heading south on the trail. When I reached 4 miles I took my first sip of Gatorade G2 and continued to do that every half mile from then on. I've discovered that this technique works well for me and I plan to do this during the half marathon. My run back to the trail head was unremarkable and I felt that my conditioning was adequate for 13 miles. The only concern I had today was with my feet -- my small toes got mashed in my Kinvaras and I worried about how they'd do if I had to run another 5 miles. I plan to run in the Mirages during the race which will help in terms of support and structure but I need to figure out a way of protecting my toes. 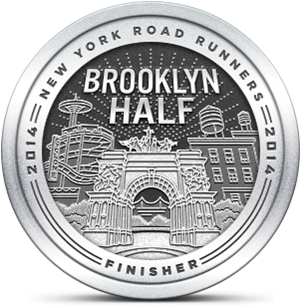 Now it's time to step down the rigor and prepare for the 13.1 miles that lay ahead on May 1st. Quad pain? How about a 5 mile hike! Breaking the rules on race day? Is the Saucony Mirage for real?